There are two primary factors that need to be addressed for your organization’s wiring and cabling. You need to manage the cables and wires that run your IT infrastructure, as well as manage the replacement wires, adapters, and countless other cables that aren’t currently being used. We’ll discuss some products that you can take advantage of to better manage all of these parts. 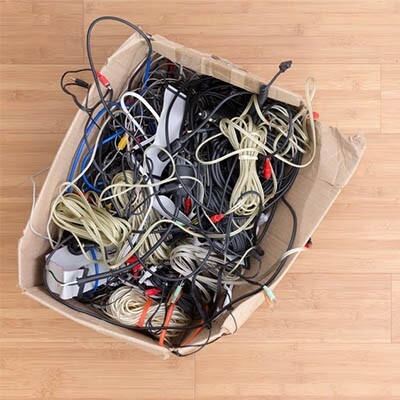 Businesses use a plethora of different wires to connect their computing infrastructure together. Here are several of them. Coaxial cable: There are different variations of coaxial cables: thin and thick. Thick cables aren’t as common these days, but thin cables (like those found in Ethernet cords) are more common. These cables aren’t as sturdy as newer types of cables. Twisted-pair cable: There are two different kinds of twisted-pair cables: shielded twisted-pair (STP) and unshielded twisted-pair (UTP). These are cheaper and less likely to break than coaxial cables, but more than that, they are easy to install and maintain. There are other options for this type of cable as well depending on your specific needs. Fiber-optic cables: Fiber-optic cables are created with conductive glass or plastic, allowing light to transmit electrical signals and providing perhaps the fastest method of transportation out there. This speed comes at a price, though; these cables are fragile and should only be handled by specially trained technicians. IBM cable: Created by IBM for IBM networks, this type of cable is a twisted-pair cable that was designed specifically for IBM hardware. If you consider your business’ data it’s life’s blood, then the cables are the arteries transporting it across your infrastructure. You should know which kind of cables are installed, when they were installed, and when they need to be maintained. When you configure your server room, you should take the opportunity to learn more about the way your cables are set up. If you do it at any other time, chances are that you’ll spend way too much time and energy disassembling and reassembling your server room. Cable sleeving: You can use sleeves--typically created from metal, fabrics, carbon fiber, heat shrink, Kevlar, Teflon, fiberglass, nylon, and more--to keep your wires together. There are braided sleeving, wire loom tubing, and spiral wraps to cover your wires and protect them from things that could do any harm. Cable tray systems: A cable tray is the ideal solution for a business that has to run a lot of cables. These are made to resemble metal baskets, PVC cable routing systems, and snake trays that let you organize your cables in ways that accommodate the structure of where you store your cables, such as the crawl space or ceiling. Cable tracks: If your organization has heavy machinery around cables or hoses, you run the risk of your cables being damaged, twisted, or tangled. Cable tracks are able to keep this from happening. Wire ducts and cable raceways: Cables aren’t always the best-looking things in the office. You can use a duct or raceway to place some protective plastic over the cables and keep them from being exposed to the world. Other: You can use other products like Velcro bands, zip ties, fasteners, and much more to keep your cabling nice and efficient. Does your business need help organizing and maintaining its cable infrastructure? Strata Information Technology can help. To learn more, reach out to us at 888.678.7282.